We invite you to indulge in the enchantment of coastal living at its finest! 'Lily Pad by the Sea' will captivate the young and old at heart... our beautiful private pool overlooking a 5-acre freshwater lake will entice the vacation connoisseur in you! Our home is located in one of Destin's most exquisite and sought after luxury beachfront developments. Just imagine... sitting back on the patio enjoying your morning coffee (or afternoon cocktails) in the ambiance of a lush tropical setting listening to the calming sounds of the lighted fountains spraying in the lake as the ducks, geese, and blue heron stop by to wish you a warm welcome! As the day progresses, you leisurely stroll down to 675' of pristine private beach, feeling the sugary white sand between your toes and admiring the breathtaking emerald green waters of the Gulf of Mexico as you watch the dolphins jump and play. All of this located just about 200 yards from our home! We must warn you, you will think you've died and gone to heaven! Our 'home-away-from-home' offers all of the comforts you could ever wish for such as... WI-FI wireless internet, TWO master suites, with 2 level private balconies, suited for the kings and queens of the bunch, luxury linens, leather recliners, new and colorful decor, an all-white well-stocked kitchen with new appliances, 2 full-size refrigerators (one for beverages), intercom and sound system throughout the house, gas log fireplace, central heating and air-conditioning, over-sized cable TVs, VCRs, DVD's, full-size washer/dryer in separate laundry room, microwave, dishwasher, coffeemaker, pack-n-play (please bring your own crib sheet & blanket), booster seat, baby monitor, just to name a few. Outside you will enjoy our private pool centered among lush colorful landscaping, outdoor dining alcove, outdoor shower, waterfront fire-pit, ping-pong table, oversized deck and patio with an abundance of seating and lounge chairs, all of this with unbelievable views from the balcony, deck, and pool areas. 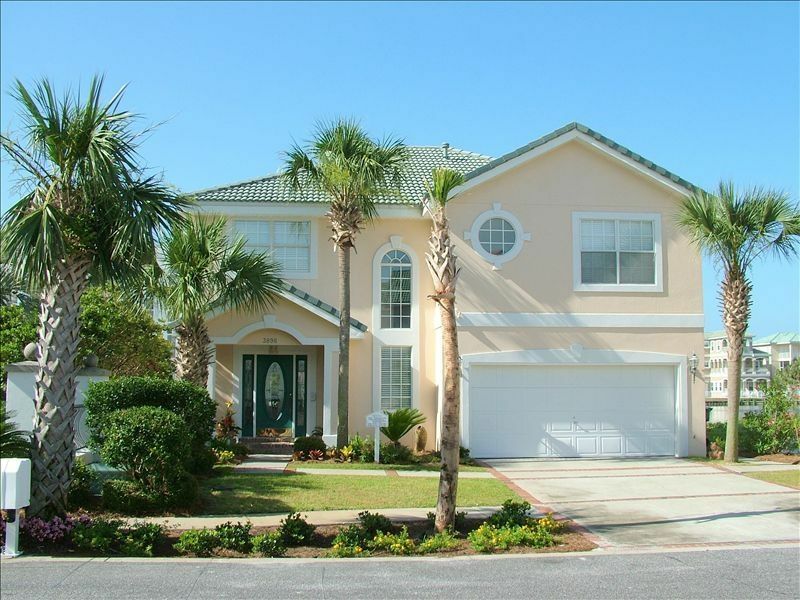 Our beautiful 4BR-4BA home offers the following sleeping accommodations: Each master suite has king-size beds with oversized closets, private baths (one with separate shower and whirlpool tub). The third bedroom has a queen-size bed and bunk bed with twin-size on top and full-size on the bottom along with an oversized closet. The fourth bedroom has two twin-sized beds and oversized closet. All bedrooms have oversized TV/DVD/VCR's, and luxury linens. There is a queen-sized sleeper sofa in the living room and two roll-away beds located upstairs. All luxury linens, kitchen, and bath towels are provided. Our home is located right in the heart of Destin within walking distance to... Destin's most popular restaurants, Destin Harbor, Destin Commons, and more than 75 exquisite shops. We are also just minutes from Destin's ever-popular Silver Sands Outlet Mall with more than 60 alluring shops to tempt you. We are right across the street from Big Kahuna Water Park, and within half a mile of Destin's popular family theme parks, including The Track. PLEASE No Smoking or Pets allowed inside due to our child having acute asthma. Parking available for 3 vehicles. Jet Ski's, Dolphin Tours, Sunset Cruises, Dinner Cruises, Water Parks, Beachcombing, and Breathtaking Sunsets!